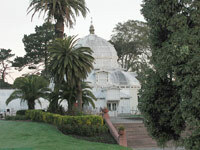 The Conservatory is a Victorian building that was imported to San Francisco in crates. The building -- "two large beautiful conservatories, modeled after those in the Kew Gardens, London" -- was ordered from Lord and Burnham Company of New York by piano magnate James Lick.The crates were brought around the horn in clipper ships, arriving in San Francisco shortly before Lick's death in the fall of 1876. The Conservatory gardens are attractive, and a pleasant place to lunch for us who work in the park (I like to sit on the Garfield statue). At the moment the flower gardens are being reinstalled, and I will put up a picture later. The Conservatory closed for restoration in 1995 and reopened in September 2003. The main entrance to the Conservatory, from gardens by Kennedy Drive. (Click for a larger view.) Winter gardens near the fuschia garden at the east end of the Conservatory.